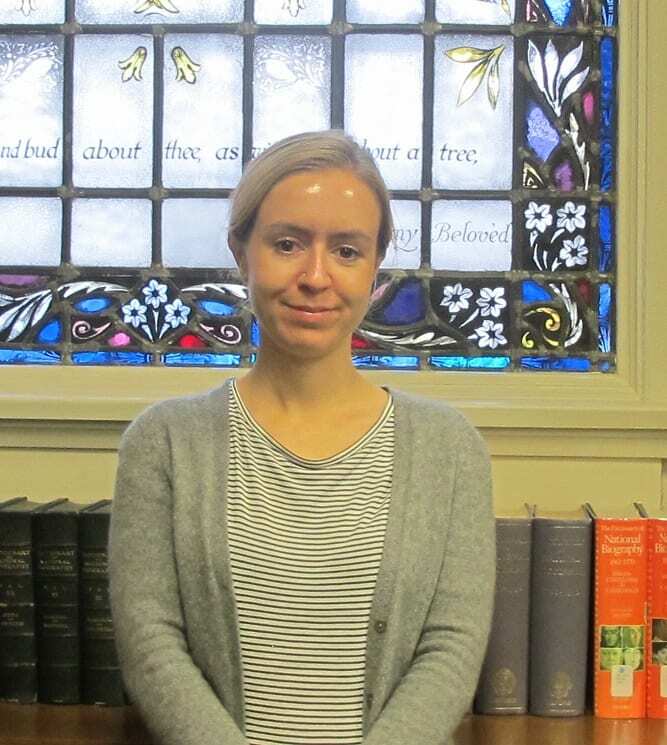 I was delighted to find out earlier this year that I’d been awarded a one month fellowship with the Armstrong Browning Library (ABL) to carry out research for a chapter of my PhD thesis on the Brownings. Even with my preliminary enquiries into the ABL’s collections, I did not anticipate just how fruitful my time here would be. My thesis is a study of hairwork—the art of making decorative objects such as jewellery and embroidery out of human hair—in Victorian literature and culture. 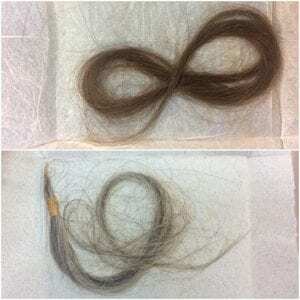 This topic tends to get rather polarised reactions: some are in disbelief that it was a common practice (the hashtag #HairyArchives on Twitter is testament to this), some are a bit grossed-out by idea of keeping hair clippings, while others show enthusiasm for something so curious and of its time. The latter, thankfully, was the reaction of the ABL staff who have all been incredibly helpful and supportive during my stay. Robert Browning’s grandfather’s hair in an 1830s memorial brooch (H0500). I should first explain that hairwork was not an invention of the Victorians. If you count locks of hair plaited and curled into reliquaries and rings, it dates back at least as far as medieval times (see Margaret Sleeman’s ‘Medieval Hair Tokens’, 1981). In the seventeenth century bracelets made of hair had a moment, as attested to by their romantic exchange in John Donne’s ‘The Relic’ and ‘The Funeral’ (1633) and Shakespeare’s A Midsummer Night’s Dream (1600), in which Egeus complains that Lysander has ‘stolen the impression of [Hermia’s] fantasy / With bracelets of thy hair’. 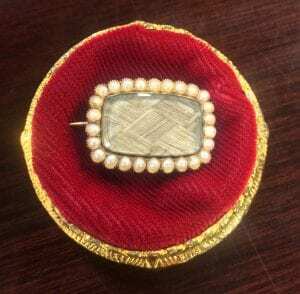 The fashion for memento mori jewellery in the eighteenth century, which often meant incorporating a lock or woven background of hair into a brooch or ring, marks the beginning of the more familiar use of hair for memento mori and mourning purposes. Robert Browning’s grandfather’s hair brooch is a prime example of this. The seed pearls around the brooch were common elements in mourning jewellery, signifying teardrops, and the back of the brooch makes its memorial function clear: ‘Robert Browning Esqr. Obt. Decr. 11th 1833. At. 84’. The popularity of sentimental fiction such as The Sorrows of Young Werther by Johann Wolfgang von Goethe (1774) played a part in shaping this period of hairwork, associated with romance and deep affection but tied, almost inevitably, to death and mourning. While these morbid associations persisted to some extent in the Victoria era, during the heyday of hairwork in the 1840s-60s it had far more to do with love, family, and friendships—with relationships with the living—than it did with anticipating or memorialising death. This is one of the key points that I make in my thesis and, with the aid of the ABL’s collections, one that can be demonstrated by looking at the place and prevalence of locks of hair and hairwork in the Brownings’ poetry, letters, and personal effects. There is a lot of the Brownings’ hair to consider. There are forty-nine recorded articles of hair and hairwork connected with the Brownings listed across the The Browning Collections Catalogue and two related archives housed by the ABL, The Altham Archive and The Joseph Milsand Archive. Though the majority of these locks have found themselves stranded in libraries and museums all over the world (at least from Eton to Wellesley College), the ABL holds eighteen of these articles—and they are some of the more interesting pieces, too. Along with eleven plain or ‘unworked’ locks of hair, there are three locks coiled into lockets, three hair bracelets and a brooch. Of these, half are attributed to RB or EBB. From top clockwise: Hair bracelet engraved ‘E B Barrett’ (H0474), hair bracelet of Mary Moulton-Barrett (G17), and hair bracelet of Henrietta Clutterbuck engraved “March 9th 1838” (G18). 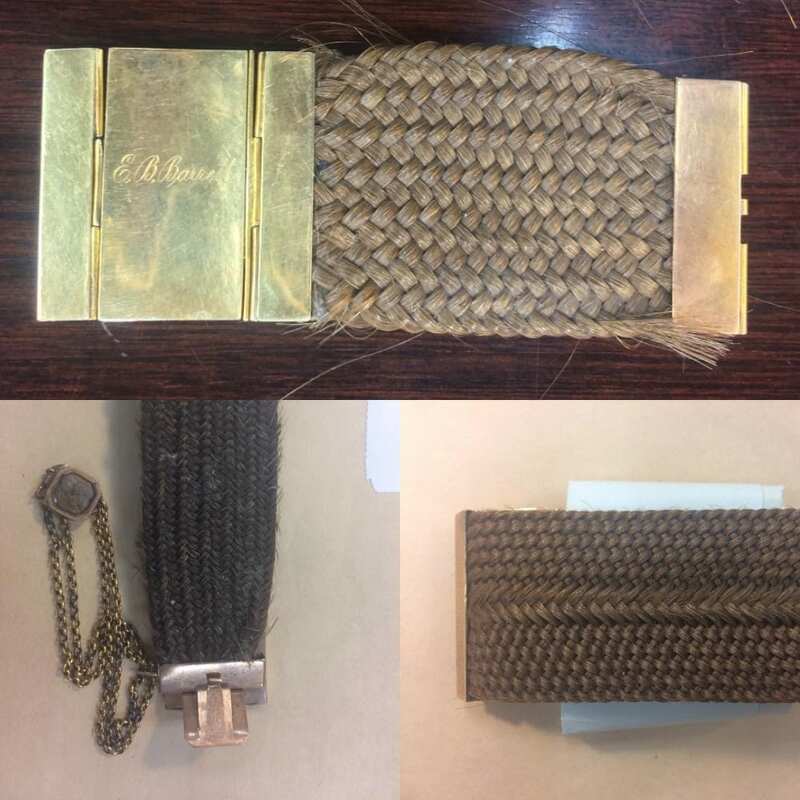 The three hair bracelets in the Altham Archive are the most elaborate pieces in the collection, though they are not unusual for the time they were made. The bracelet belonging to Mary Moulton-Barrett, EBB’s mother, another in memory of Henrietta Clutterbuck (a family friend from when the Barretts lived at Hope End), and the one of EBB’s hair are very similar in appearance. 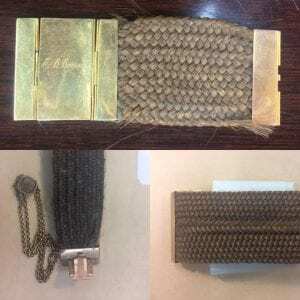 Each consists of a wide band of woven hair fitted with a flat clasp: a popular design in the 1820s and 30s and comparable to other early-nineteenth-century bracelets, such as one made of Anne Brontë’s hair in the Brontë Parsonage Museum, Haworth. 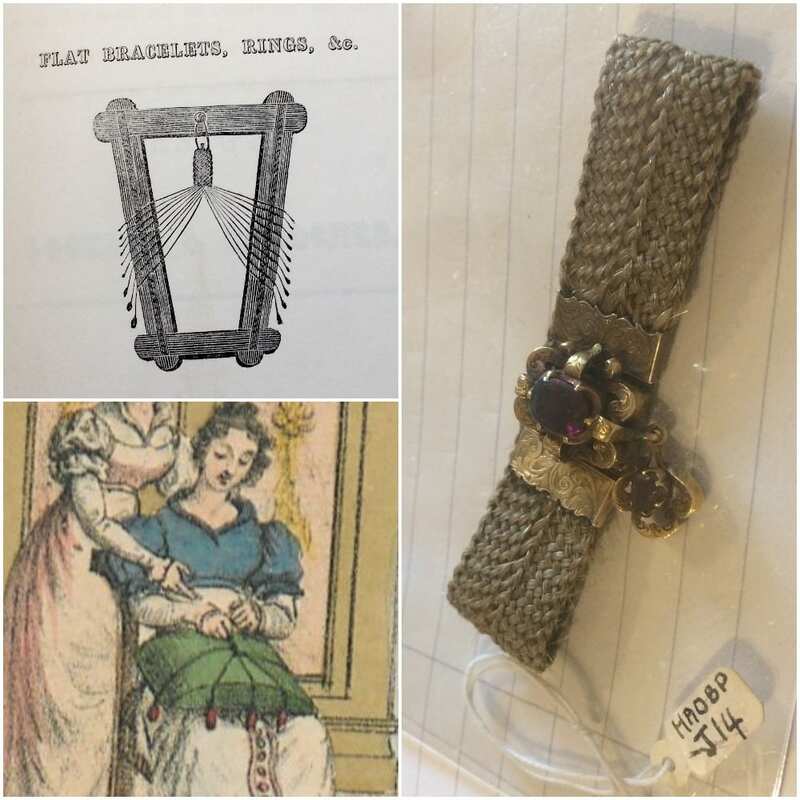 From top clockwise: A hairwork frame from William Martin’s Hair Worker’s Manual (1852), a hair bracelet of Anne Brontë’s hair (HAOBP: J14), and part of the frontispiece of Emilie Berrin’s Thorough Instructions for Women on the Production of All Possible Kinds of Hairbraids (1822). This style of hairwork would have been made on a frame or weighted across a cushion in order to plait the many strands of hair evenly and, while this set-up could have been achieved at home by the amateur, was more likely completed by a jeweller or professional hairworker. This transaction was, however, not without anxiety. There is mention in the Brownings’ letters of hair going missing while in the possession of jewellers. Part of a lock of EBB’s hair, requested in a letter by RB and the subject of her poem ‘I never gave a lock of hair away’ (Sonnets from the Portuguese, 1850), was placed in a ring bearing her nickname, ‘Ba’, and sent to a jeweller to be resized for RB’s little finger. When he received the ring back from the jeweller EBB’s hair was gone. She sent him another lock, RB reasoning that ‘it seems probable that there was no intentional mischief in that jeweller’s management of the ring—the divided gold must have been exposed to the fire,—heated thoroughly, perhaps,—and what became of the contents then!’ (15 December 1845; BC 11, 240-41). Lock of hair cut when Robert Barrett Browning was nine days old (H0501), and lock of hair cut later in life, but undated (H0502). Finely woven hairwork offered a way for friends and family to memorialise their relations and relationships in a wearable and touchable memento. Locks of hair, however, could be equally precious, treasured not for their intricate form but for the affections and memories they manifest. The two locks of Pen Browning’s hair demonstrate this most clearly, one cut when he was nine days old and another undated but, by judging its grisly appearance, cut in later life. The lock cut in Pen’s childhood is curled into the shape of a bow, or perhaps an infinity symbol, a golden token of youth and possibility. The other lock curls untidily round itself, its various shades of blonde and brown and grey marking the passing from youth to old age. EBB wrote fondly of Pen’s hair in her letters (which are fully searchable using the in-house database ABL Research Tools) and occasionally sent locks out to her friends, proud of but precious about his long golden ringlets. She writes to Joanna Hilary Bonham Carter, for instance, ‘I will send you in some niggardly way the ‘hairs’ you ask for—confessing myself a miser’ (25 May 1854; BC 20, 225-26). I am interested also in how hair is aligned in the Brownings’ poetry with gold and precious goods—be they a figure of spiritual wealth or worldly economic value—particularly in EBB’s ‘The soul’s rialto hath its merchandise’ (1850) and ‘Only a curl’ (1862), and RB’s ‘Porphyria’s Lover’ (1842) and ‘Gold Hair: A Story of Pornic’ (1862). The collections of the ABL have provided a rich source of material as I chart these uneasy intersections between hair and money, the gift of hair and its expected return, and hairwork and poetic work. From left: Hair album of the Estes Family (Texas Collection), manuscript of EBB’s ‘Lines on the Portrait of the Widow of Riego’ and lock of the widow’s hair (H0508), replica of a locket worn by EBB containing RB’s hair (H0493), manuscript page of Leigh Hunt’s ‘To Robert Batty, M.D., on His Giving Me a Lock of Milton’s Hair’ (ABL Victorian Collection), and a lock of EBB’s hair (H0479). 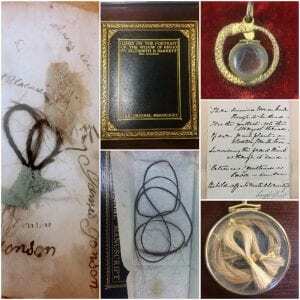 There are many more curious hair tokens I would like to share from my research, just a sample being: a replica of EBB’s locket encircled by a serpent containing the hair of RB; a beautifully plaited and coiled lock of EBB’s hair; the long plaited lock of the widow of Riego which is tucked inside the manuscript of EBB’s poem on her portrait; a page of the manuscript of Leigh Hunt’s poem on Milton’s hair which begins ‘There seems a love in hair though it be dead’; and the hair album of the Estes family from The Texas Collection of the Carroll Library. Each of these unique artefacts offers a further step to understanding the vibrant and varied culture of hairwork in the nineteenth century. As Dr Duc Dau noted in her blog post for the ABL last year, ‘For the tactile among us, there’s a certain thrill at the experience of touching these manuscripts and bits of paper’, but it’s this thrill that forms a key part of my project. Sometimes, physical proximity and touch can illuminate more about an artefact than reading about it can—you get a real sense of the scale, texture, opacity or translucency, incongruous lightness or heaviness, and of the fragility or sturdiness of an item that you simply cannot work out with even the best quality digital image. And it’s these precise qualities that need to be defined if we are to understand the affective power hairwork held for the Victorians. The embodied experience of handling and viewing and contemplating locks of hair—seeing the way they want to uncurl and escape from envelopes and regarding the light-reflecting litheness of woven hair bracelets even two hundred years on—makes sense of their lively and allusive presence in the poetry of the Brownings. I would like to end by thanking all of the ABL staff for their incredible support and for helping me to find resources (and, of course, hair) for my research in places I would never have thought to look. And I would strongly encourage other graduate students in Victorian studies to look into the collections of the ABL—there is much more than just a few locks locked away in the archives. This entry was posted in Reflections from a Visiting Scholar and tagged Elizabeth Barrett Browning, Heather Hind, Robert Browning by Laura French. Bookmark the permalink.